1. Traditional Impact crusher broken, material into the body with back directly after the collision was the first time, because the material is of high-speed rotor, the function of air flow and material circulation layer is often a collision with the back and change the direction to form a second, and this blow is given priority to with eccentric shock, shock of eccentric rather than a positive hit the material crushing effect is not ideal. 2. When the normal load is broken, most of the material forms a circulation layer that rotates in the same direction as the counter-attack in the crushing chamber, so that the relative speed of the material and the counter-attack is reduced, and the strike rate and the striking strength are also greatly reduced. 3. The production efficiency of traditional Impact crusher is also affected by a series of parameters, including the size of the crushing chamber, the speed of the Impact crusher and the nature of the material being processed. The increase in Impact crusher speed is limited by factors such as manufacturing conditions, process, and cost. After the counterattack speed is determined, the productivity of the crusher depends on the size of the crushing chamber. Science has shown that increasing the diameter of the crushing chamber will reduce the crushing effect, and increasing the depth of the crushing chamber can increase the yield. The uniformity of the distribution of the processed material in the depth of the crushing chamber has a great influence on the yield and quality. 1. Increase the depth of the crushing chamber when the diameter of the crushing chamber is constant. 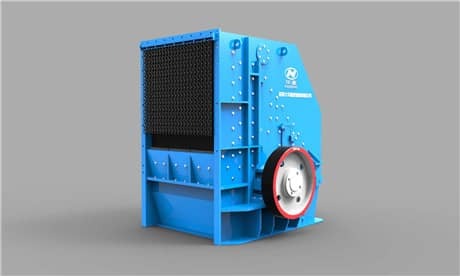 This scheme can only have obvious effects by changing the distribution state of the material in the crushing chamber and increasing the effective hitting frequency of the material. 2. In the case where Impact crusher speed is constant, increasing the relative speed of the material in the crushing chamber and colliding with the Impact crusher can increase the striking strength. 3. Reasonably configure the thickness of the Impact crusher to reduce the eccentric blow. Previous Article：What are the Requirements for the Vertical Impact Crusher Hammer in the Production Side?